Pneumonia. Her left lung was very hazy on the X-ray and there's essentially a lot of gunk stuck there that needs to shift. 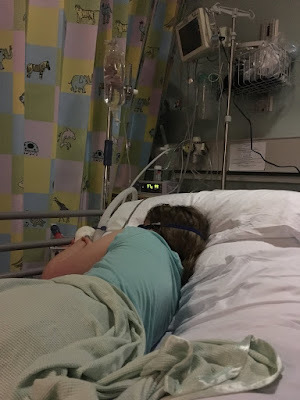 My daughter is on oxygen through a nasal tube. She's still not getting enough air into her gunky lung by herself. Her shape from her scoliosis, her poor muscle tone from her Prader-Willi Syndrome, and her daintiest of dainty and infrequent coughs being too damn dainty and infrequent, are all complicating matters. We're waiting for the strong antiobiotics to kick in. In 24 hours, if hands-on physio, breathing physio, and the meds don't shift the gunk, a decision may have to be made to do a chest drain. "I feel grotty, Mum," my dark circle-eyed girl told me. "I just want to get better." In that brain-bamboozling way she has of random conversation shifts, she then said: "When you went to get our things earlier you missed a lion." I looked at her in alarm, thinking she had suddenly started hallucinating. 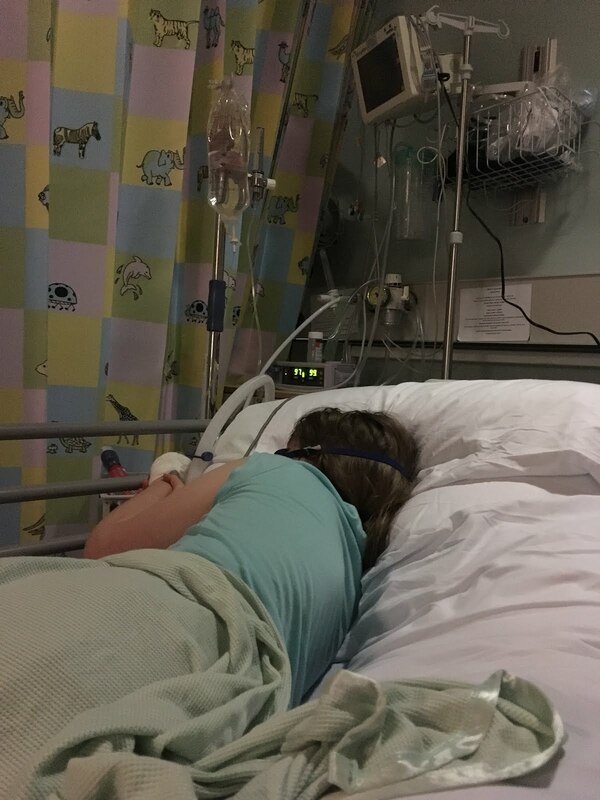 "I think Daddy would have said if there had been a lion on the hospital ward, sweetheart," I said, patronisingly. "There was a lion," she insisted, and of course I found out later she was right. A person in a furry suit kind of lion. One of those 'supposed to be charming but actually quite creepy' type of things you see visiting children's hospital wards. Like clowns. Or One Direction. (I'm not going to even mention Jimmy Savile). Another sofa-bed vigil is about to start. I think there may be less vigil-ing in my vigilance tonight because I'm cream-crackered. Not as cream-crackered as my pale and poorly girl, though. She's puffed her way through her breathing exercises today, with great difficulty, and she's all puffed out. I just want her to get better, too. Can't be doing with mobile phone-posting a video tonight, so knock yourselves out by Spotifying Puff The Magic Dragon. Or something by Puff Daddy, I suppose. But the dragon one will be better.